As a child many decades ago, I played one of my first wargames, a long-forgotten game called Panzerblitz. It had platoons of tanks, infantry and artillery that moved about on the game board and shot at each other, but even at the age of 12 I found it unsatisfying (all combat was resolved in the form of odds ratios) and that would lead me to design the game that became Panzer Grenadier a few years later. Panzerblitz included a tiny background booklet that showed how the various platoons came together to form higher formations like battalions and divisions. I read it and re-read it over and over. Included on the chart were a few units not included in the game, like the German 170mm artillery piece, which actually shouldn’t have been there (it served in corps- and army-level artillery battalions, not in divisional regiments) but it was there and I wanted it in my game. I made one myself – the game’s graphics were pretty primitive, though considered radically innovative when it was new – but that wasn’t enough. I wanted a “real” one. So from the start I wanted to include one in Panzer Grenadier, but never had the opportunity. Now it’s come. I designed Panzer Grenadier with an eye toward giving infantry (the “grenadier” part) as many things to do as the tanks (the “panzer” part). Yet the game is actually based on interlocking combined arms, with artillery playing just as much of a role, and we’ve never properly played up that aspect, much less included a 170mm cannon piece. With The Book of Armaments, we’re redressing that imbalance. Volume One: Eastern Front Artillery is just what it sounds like, a book about artillery in the Eastern Front Panzer Grenadier games (Fire in the Steppe, Broken Axis, South Flank, Burning Tigers and Gates of Leningrad and the expansion books Armata Romana and Grossdeutschland 1944). This is what the role-playing publishing world calls a “splatbook,” a sourcebook focused on one particular theme but not including core game rules or an adventure (in our case, scenarios and/or battle games). Instead it’s about artillery, following the splatbook format with some historical background (it wouldn’t be an Avalanche Press book otherwise) but mostly it expands what you can do with your artillery. In Panzer Grenadier, artillery comes in two basic flavors: on- and off-board. On-board artillery is that represented by playing pieces, each one representing a single battery. Off-board artillery is, like the name says, not on the board. In the scenario instructions, each player receives an allotment of artillery increments, which can bombard targets on the playing board (in some scenarios either or both players may receive none of these). The increment can then shell a target hex on the board in the same manner as an artillery battery. Just like a playing piece on the board, every off-board increment represents an artillery battery and its strength matches up with the battery’s indirect fire rating – this is why most German increments have a strength of 16 just like the 105mm howitzer, and some Soviet increments are 18 to match their 122mm, and so on. In The Book of Armaments, we’ve taken that down the logical path to provide an actual playing piece (the same as the usual playing pieces you move and fight with on the game board) for each off-board artillery increment. You place these on your new Artillery Display Card (also included in The Book of Armaments, one for the Soviet player and one for the German/Romanian player), and then you change their status (moving them to a different box) as you fire them. While it helps keep track of which ones have fired, more important is the coolness factor of playing with artillery batteries on the game board instead of numbers that you write down on paper. Some of the off-board artillery increments have never appeared in a Panzer Grenadier game as on-board artillery batteries, like the German 170mm (strength 28) and 210mm (strength 30) or Soviet 203mm (strength 28) but have shown up in the off-board section. So you get new playing pieces for those, and that means that you can also bring them onto the playing board. You also get enough extras of pieces that have already appeared (like the German 105mm howitzer) to cover all of the off-board increments. And you get them in all the necessary color schemes: German Army, Waffen SS and Grossdeutschland; Red Army of Workers and Peasants and Soviet Guards. There are 88 new pieces all told, die-cut and silky-smooth. Because the artillery pieces in use don’t change much over the course of the war (there are new models introduced, but they rarely differ enough in capability to rate a new piece in game terms), the set should be good for future Panzer Grenadier games set on the Eastern Front, too. We’ve also added some new optional rules for artillery, increasing your options for its use. Most of them are drawn from the new artillery rules for the related Infantry Attacks series. Now you can shoot at opposing off-board artillery (counter-battery fire) to suppress enemy artillery (sometimes that’s more useful than shelling enemy troops). And you get some options that increase your choices in how the artillery fires, at a cost in added complexity (and sometimes ammunition, which means you’ll have to manage that – to some of you, that’s an added feature). Panzer Grenadier is a relatively simple game (compared to most other wargames; it’s obviously far more complex than those played by normal people). I didn’t want to get too far away from that; the new additions aren’t overly complex and are most definitely not the coming of Advanced Howitzer Leader. The Book of Armaments is designed to increase your game-playing fun, and I think you’ll like that. 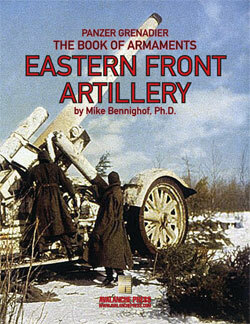 Don’t wait to put The Book of Armaments: Volume One, Eastern Front Artillery on your game table! Join the Gold Club and find out how to get it before anyone else!